Occasionally I blog about self-published books, pointing out that they have a distinguished history, and that there is an enormous difference between publishing a book yourself and "vanity publishing." Self publishing can be practical for all sorts of reasons, especially if you have a built-in audience for your book. That's the case with Kyra Alex, the owner of Lily's Café on Deer Isle in Maine. I have never met her, but one of my best friends in the world now lives in Maine, and he has vacationed there for about 15 years. He discovered her café, and in 2001 he brought me back Lily's Café Cookbook as a gift. It was a slim little thing, well-designed and full of happy photographs, yet still obviously self-published (no publisher colophon, just the mark of Thompson-Shore, a book manufacturer). I could see, however, why this kind of publishing made perfect sense for this author, as a way to share recipes and her outlook on food and life with her guests. Money from the book itself is probably secondary to the strong relationships it builds. My habit with cookbooks is to write a little note next to each recipe with the date I first made it, my experience with the recipe, and a word about whether or not I would make it again since it is easy to forget five years later how each one worked. For some reason this book captivated me and I started writing notes all over it. For Barbara's Pumpkin Muffins: "Oct. 12, 2002. Amazingly good, and they freeze well. Made 1/2 recipe for six nice-sized muffins." For Banana Pecan Scones: "Nov. 21, 2003. Made for Artist's Way group, cut w/a heart-shaped cutter. Followed recipe exactly." For Lily's Café's Most Requested Chocolate Layer Cake: "Better than Martha Stewart's one-bowl chocolate cake, and easier!" I ignored my other cookbooks by James Beard and Marcella Hazan in favor of this modest volume from a chef who to my knowledge has never been on TV, and who paid to publish her own book. So what did I get for Christmas this year from the same friend up in Maine? 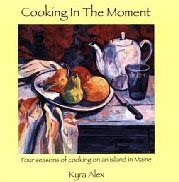 Cooking in the Moment: Four Seasons of Cooking on an Island in Maine by none other than Kyra Alex. She signed it "For Carole, Here's to a decadent bite of chocolate cake and the wonderful moments it brings! Kyra Alex." I was as thrilled that she knew my name as if she had been M. F. K. Fisher or Julia Child herself (and yes, Kyra Alex has cooked for Julia Child... one year she made her official birthday cake!). Imagine, all this excitement over self-published books from an author who doesn't even have a website, let alone a Food Network deal or her own line of kitchen knives. If you want to buy one of her books, I recommend the first one for now, until I see how the second one goes... but something tells me it will be just as wonderful. i love this post, and am now totally inspired to write in my cookbooks and get the book! I am that best friend in the world who gave the cookbooks as gifts. A visit to the Cafe is well-worth the effort if you ever find yourself in DownEast Maine. It is comfortable, welcoming and warm! The food is very satisfying, often made from locally-produced items. . . BTW, I love the easy tomato sauce in the original--now, out-of-print--Lily's Cafe Cookbook. . . I love your comments about Kyra's cookbook and I love all of Kyra's recipes--easy to follow and the end result is always outstanding. A visit to her Cafe (Lily's) will find you in a warm, inviting and just plain fun atmosphere. A must do if you find yourself in Stonington, Maine. Are you sure "your field" is really your field? Was your editor really angry in that e-mail?